Family SCHALBER from 1722 to our days. Genealogy and history of the family SCHALBER. In Uberach, the elders told us that Christian and Jean SCHALBER would have come from Austria, Hungary or from Germany. However nobody had made researches to verify it. 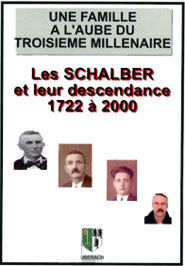 Today in France all persons still wearing the name SCHALBER are descendants of them. Like the book, published in 2000 by Richard Schalber, this website will present you the story and the origins of the family SCHALBER through various photos and the individual presentation of each member. It collects the memory of the family SCHALBER since 1722, date of Jean SCHALBER's marriage whom arrived to Uberach with his father Christian from Saurs, in the region of Landeck, in Tirol (Austria). We want to thank all those who supported us and helped in our researches, those who supplied us their old documents and their pictures to make them available to a large number of people. One special thank to Jean-Claude SCHALBER for his support and his help in the researches on our origins. Do not hesitate to communicate us any new change in the family (marriage, birth, death) which is not indicated on the website yet. For the members of the family, discover in the Private section all the members of the family through the complete family album as well as many other documents! Welcome to Solène ZAHNBRECHER (24/10/2014) daughter from Martine SCHALBER and Dominique ZAHNBRECHER. Welcome to Kim SCHALBER (27/01/2013) daughter from Laurent SCHALBER and Elodie MEYER. We were very sad to learn about the death of Marie-Thérèse DENU (09/02/1924 - 20/07/2012). We were very sad to learn about the death of Raphaël MENÉ (07/04/1977 - 25/04/2012). Welcome to Elio ZAVAGNI (12/12/2011) son from Julien ZAVAGNI and Sarah MIGNOT. Welcome to Bastien THAUVIN (06/11/2011) son from Laetitia MENÉ and Frédéric THAUVIN. We learn the death of Marie-Madeleine SINGER (30/05/1924 - 28/10/2011). We learn the death of Françoise LEIRITZ (29/11/1930 - 04/08/2011). Adding the descendants of Pierre KINDERSTUTH (12/10/1965). Adding the date of wedding from Elisabeth SCHALBER (19/12/1773 - 04/03/1837). Adding the date of wedding from Claude LICKEL (12/05/1983). We learn the death of Marie-Louise SCHALBER (11/05/1928 - 23/05/2011). We learn the death of Cécile DENU (06/05/1916 - 08/05/2011). We learn the death of Roger CRIQUI (21/06/1928 - 11/11/2010). Welcome to Léa HEIM (23/09/2010) daughter from Déborah SCHALBER and Ludovic HEIM. We learn the death of Adrienne WAGNER (19/07/1932 - 17/10/2010). Welcome to Maxime JUND (15/02/2010) son from Estelle MENE and Alain JUND. Update of the family album with a lot of new pictures and new members. Update of the family from Joseph SCHALBER (13/12/1771 - 26/02/1838) from Gumbrechtshoffen. Adding new members to the family. Adding a new page with the latest changes on Persons. Adding new members to the family of Joseph SCHALBER (13/12/1771 - 26/02/1838) from Gumbrechtshoffen. We learn the death of Marie-Jeanne BEBON (06/02/1933 - 17/09/2009), wife of André SCHALBER. Adding the descendants of Estelle MENÉ (14/07/1974 - ). The pages will be gradually updated towards the new interface. Welcome to Alice REY (25/04/2009 - ) daughter from Delphine KURTZ and Pascal REY. Welcome to Esteban ZAVAGNI (13/03/2009 - ) son from Laurent ZAVAGNI and Stéphanie BOWE. New design for the page with the presentation of the persons. Four generations are now displayed at the same time. One click on each person allows to navigate more easily in the tree. Update of the homepage with a new organization and a new banner. Addition of the dates of birth of Salomé, Jacob and Michel SCHALBER. Addition of the branch BAUMANN, the descendants of Elisabeth SCHALBER. We learn the death of Ernest LICKEL (30/09/1919 - 19/02/2009). There were 1177124 connections since the website is online.